What should we wear to our Vermont engagement shoot? We want to be warm, but also stylish. Couples ask me these questions every year and I understand why! Fortunately there are tons of tips and tricks to accessorize for your Vermont engagement session, even when it's an outdoor session in the middle of winter. Honestly, the weather in Vermont is never as predictable as we'd like it to be, so these tips will also be useful for autumn engagement sessions and spring engagement sessions in Vermont. Coats: Many adults have more than one coat--you may have a casual, everyday coat and a more professional coat. Maybe one is more vibrant or patterned than the other. Coats can be a great accessory for a winter engagement shoot and they are one of the most functional winter accessories too. Scarves: I love cozy scarves and statement scarves. Bring a scarf that goes well with your skin tone and don't forget to coordinate with your partner's skin tone as well. Your faces will be close to one another's, and so will your necks! The right scarf will make all the difference in keeping you warm and cozy and stylish during your engagement session. Bring options! I will help you choose. 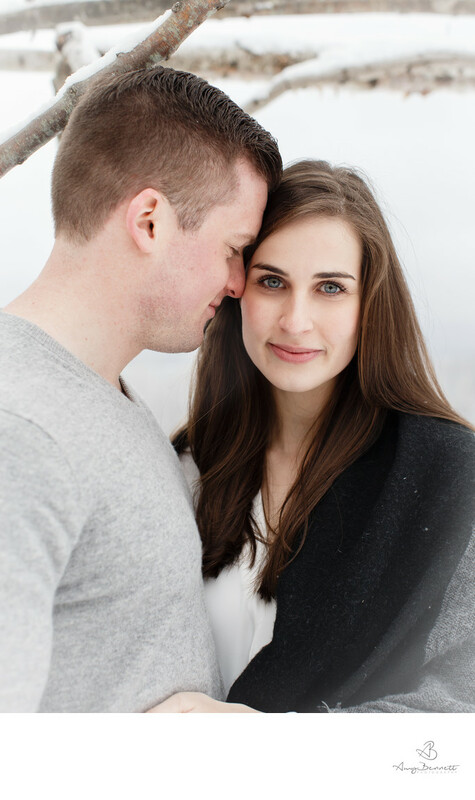 Sweaters and sweatshirts: The formality of your engagement session is up to you. If you have a favorite sweatshirt or your partner has a favorite sweatshirt that you love to wear, consider taking some more casual portraits in that! Of course, sweaters can also be formal or informal for a photoshoot in the winter months. Your engagement photos should feel authentic to you, otherwise you won't love them as much as I want you to. Boots: Consider how much we'll be moving around and the amount of snow and ice you'll be walking on or through as you choose what boots to wear to your engagement photography session. At the same time, functional boots can also be fashionable. What you choose to wear to your Vermont winter engagement shoot is up to you. As long as you have some layers, an extra pair of socks, and a fabulous wedding photographer specializing in Vermont weddings and engagements, you will be all set! You will love the high quality images Amy Bennett will produce at your engagement session and so will your friends and family!